Welcome, welcome to my blog. I hope you are having a great day to far. 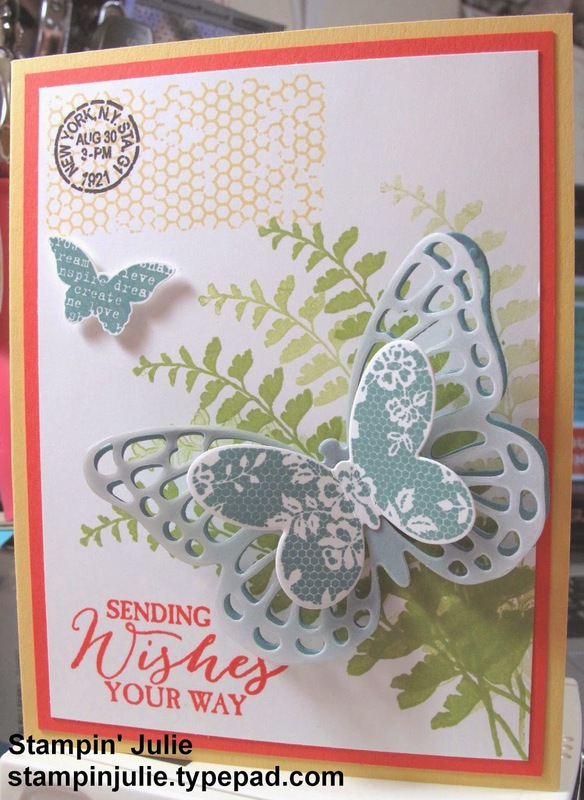 Today, I have another butterfly card for you using the Butterfly Basics stamp set from Stampin' Up! and the Butterflies Thinlits that I used on my Big Shot to cut out. I first used a piece of So Saffron and cut it in half to make the card base. I then cut a piece of Calypso Coral to 5-1/4" x 4" and a piece of Whisper White to 5" x 3-3/4". I first stamped the leaves from the stamp set in Pear Pizzazz on the piece of Whisper White. Next, I stamped the honeycomb in So Saffron in the upper left corner and the date stamp in early Espresso on top. Then I stamped the sentiment in Calypso Coral in the lower right corner under the leaves. Now onto the butterflies. I stamped the twp smaller butterflies onto a piece of Whisper White. I then punched the smallest butterfly out. Next, I used my Big Shot to cut out the large butterfly in both Lost Lagoon and Vellum. Then I adhered the layers together and I then glued the vellum butterfly onto the other one and glued the smaller butterfly on top of the vellum and then adhered the whole butterfly to the card using Stampin' Dimensionals. And the card is done. Thank you so much for coming to my blog and reading my post. If you would like any of the items I have talked about just click on the links below. Also, if you would like a catalog, Paypal me $5.00 to scrapnmom@live.com and I will get one in the mail to you. Thanks again and have a great day!